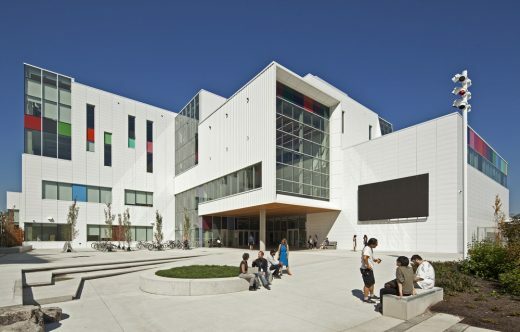 Emily Carr University of Art + Design in Vancouver opens its new campus today. The renowned 92-year-old institution relocates to the east side of downtown Vancouver from Granville Island to a purpose-built facility designed by Diamond Schmitt Architects. Composed as a sequence of interconnected program areas, the building is linked by light-filled atria that create nodes of visual connection, transparency and social interaction. In this dynamic spatial environment, there is constant exposure to the full range of multidisciplinary activity and the environments in which they are produced. Wall space dedicated for the display of art and areas configured for impromptu performance and artistic experimentation create an ever-changing canvas designed to enable a high degree of collaboration among students, faculty and staff. There are dedicated studios for advanced digital media and virtual reality design, 3D production, Health Design, Robotics, Data Visualization and Media, Communication Design, Industrial Design and Graduate Studies in all areas as well as the traditional arts of painting, sculpture, photography, illustration, drawing, print media and ceramics. “Communal space facilitates a dialogue between these digital and analogue disciplines and the multi-storey Learning Commons serves as a crossroads for exchange that connects with the full-length Concourse and the outdoors,” said project architect Ana Maria Llanos, who heads the Vancouver office of Diamond Schmitt. The building captures views of the Vancouver skyline and the Coastal Mountains from many vantage points, including terraces and workshops and the fully glazed, north facing painting and drawing studios on the fourth floor. 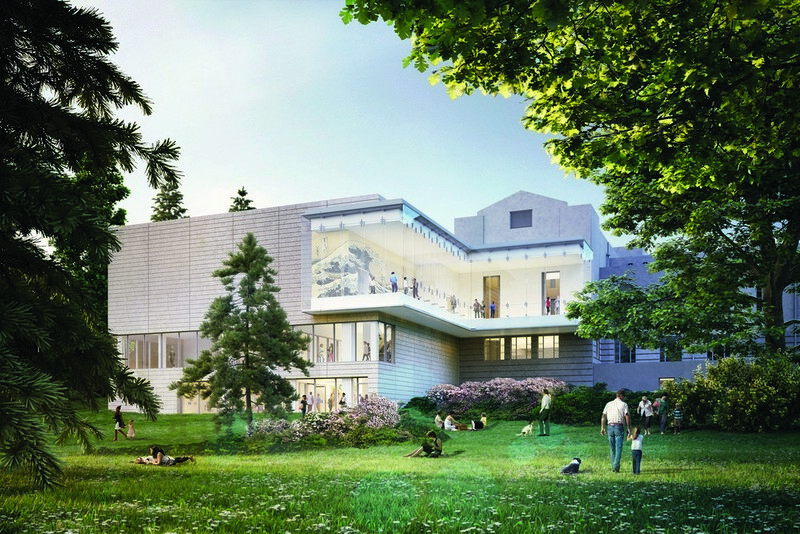 At ground level, the transparent façade reveals sightlines into the building and highlights galleries and other public elements of the campus. A colour palette drawn from the works of the namesake British Columbia artist Emily Carr punctuates the white metal cladding. Landscaped connection links the main entrance at St. George Plaza on the west side with the Wilson Arts Plaza on the east, which has a large screen and seating to bring performance and display outdoors. In this way, the building and landscape work in concert to engage the community and enable creativity and experimentation to flourish. 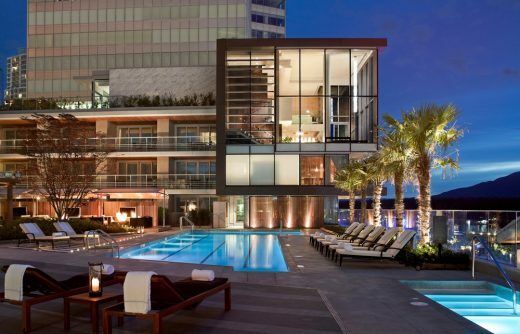 This highly sustainable building incorporates an array of energy and water-saving measures to be cost-effective in operation. The flexible nature of the space makes the building easily adaptable to the evolving nature of arts disciplines. 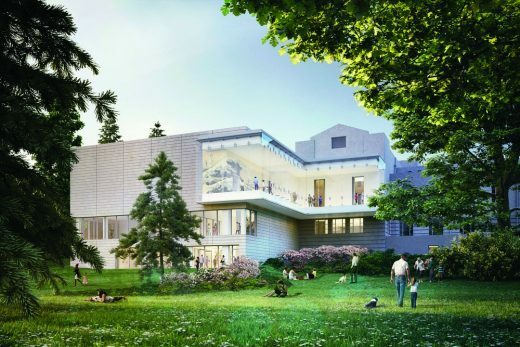 The new campus positions Emily Carr University for its second century of inspiring and creating a rich legacy of artistic endeavour for which the institution is celebrated. 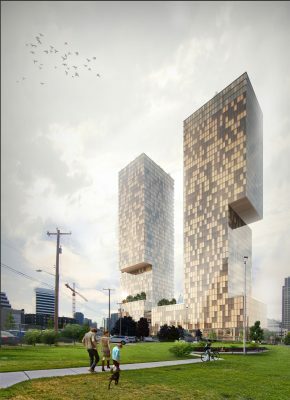 The team for this Public Private Partnership (P3) includes Chernoff Thompson Architects, the Government of British Columbia and Ellis Don Construction Company. Diamond Schmitt Architects (www.dsai.ca) has offices in Toronto, Vancouver and New York City. Informed by urbanism, driven by design, the firm’s extensive portfolio includes performing arts centres, residential, recreational and commercial buildings, research and academic facilities. 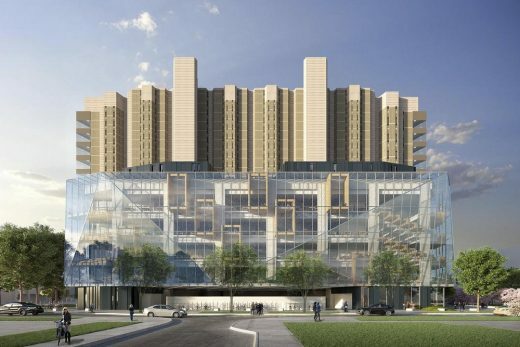 Current projects include the Canada Science and Technology Museum Collection and Conservation Centre in Ottawa; Robarts Common at the University of Toronto; and the design for David Geffen Hall at Lincoln Center in New York City. The firm is currently shortlisted for the UK Holocaust Memorial and the Centre for Music, the new concert hall for the London Symphony Orchestra.